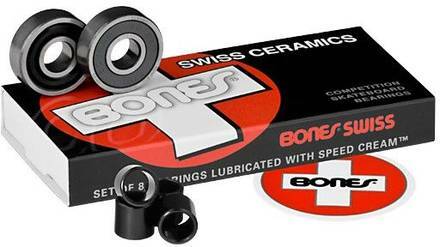 Bones SWISS CERAMICS bearings are in a class by themselves. There simply is no better bearing. The ceramic bearings comes with Cerbec ceramic balls, that are much lighter, harder, stronger, and longer lasting than the finest steel balls. Labyrinth shields ensure a consistently clean running environment for the Cerbec balls.